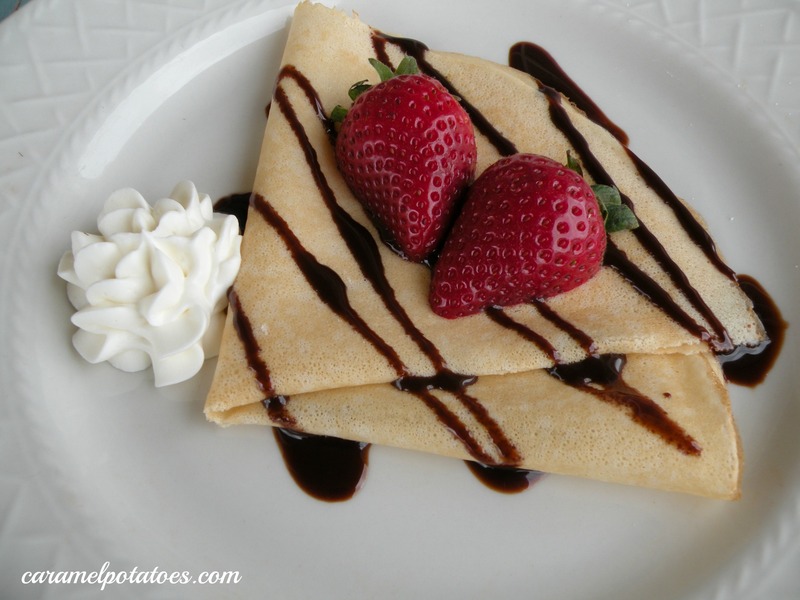 One of our more popular recipes is Red Velvet Crepes. And they are amazing. But then I realized we don’t have a basic crepe recipe. This recipe is my go to for crepes. It always has been since I was a kid even. There is something about a warm thin crepe filled with berries and whipped cream that just delights me. So if you are looking for a breakfast treat for your sweetie this Valentine’s Day you should give Crepes a try. Either the basic crepe or the Red Velvet Crepes. You just can’t go wrong with either one. Sift together the flour, salt, baking powder and powdered sugar. Mix together the eggs, milk, water and vanilla. Make a well in the dry ingredients; pour in the liquid ingredients. Combine with a few swift strokes. Ignore the lumps; they will take care of themselves. Heat a 5 inch skilled over medium heat. Coat skillet with nonstick cooking spray. Add a small amount of batter (we are talking less than 1/4 cup) and QUICKLY lift the skillet and rotated it to cover the bottom of the pan. Cook until brown underneath (it cooks quick so watch it close) and flip to cook the other side. Repeat with remaining batter. I love crepes with bananas and nutella! LOVE LOVE!! We fill ours with chocolate pudding, strawberries and sprinkled with powdered sugar! !